Easy and Festive Sweet Potato Goat Cheese Appetizer with Cranberries & Honey Balsamic Glaze, finished with a blood orange infused olive oil and fresh basil! 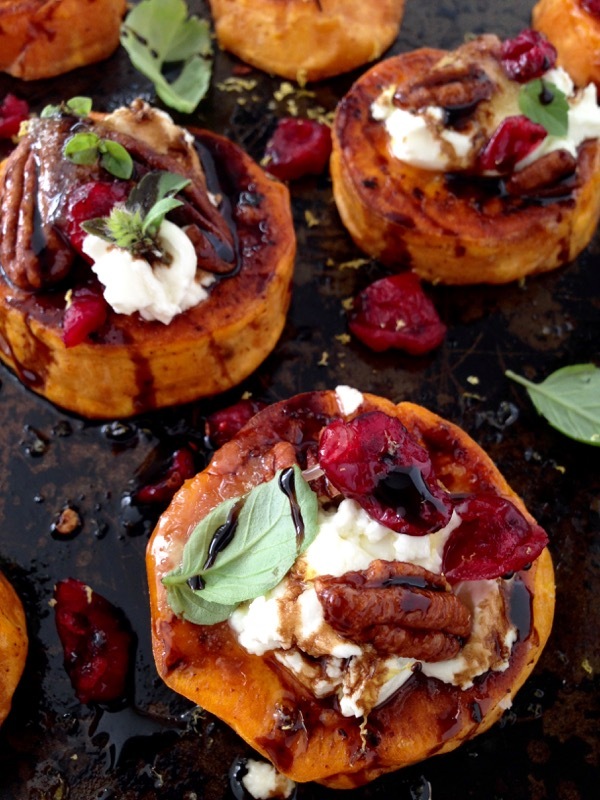 I have the best sweet potato rounds with goat cheese appetizer for us! Because I wasn’t kidding when I said I couldn’t stop baking sweet potatoes! 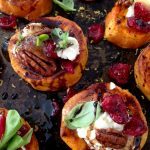 I had the creamiest, honey goat cheese in the fridge, so I crumbled some on my baked sweet potato rounds, whatever I had left of my Sicilian honey, a few candied walnuts or pecans for crunch, a handful of cranberries and a nice drizzle of balsamic glaze. Let’s not forget the fresh basil leaves of course! Oh, and a light drizzle of blood orange olive oil to finish, because it’s just magical you guys! 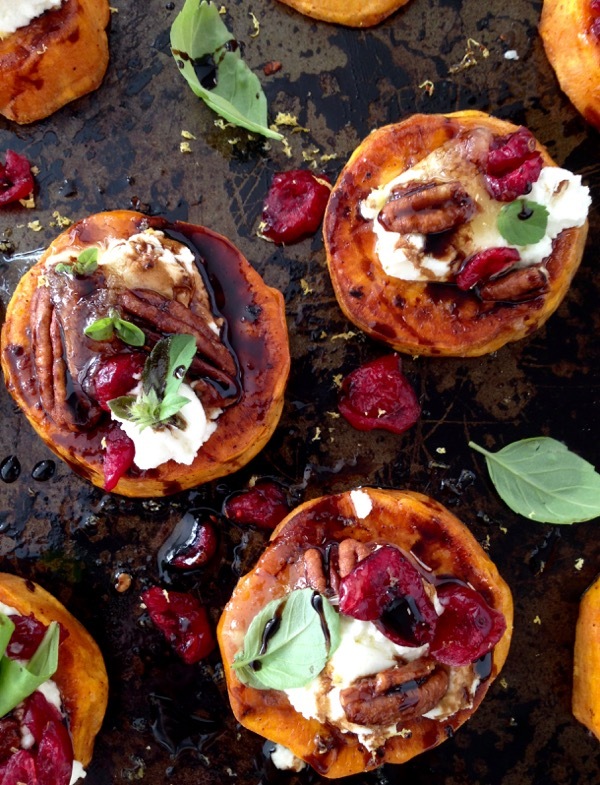 I call these my Goddess sweet potato goat cheese appetizers! 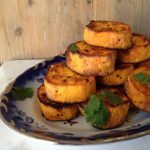 A really nice hot oven, well oiled sweet potato rounds so they don’t stick, a good pinch of sea salt and sweet paprika for a nice golden presentation. I’m clearly having a full-blown sweet potato obsession at this moment in time. So much so, that my brain cells are trying to figure out yet another recipe as we speak. sweet potato goat cheese and fried sage, yummy! A Festive Appetizer: Sweet Potato Rounds with Goat Cheese, Cranberries & Honey Balsamic Glaze, finished with a blood orange infused olive oil and fresh basil! In a small bowl combine the olive oil, sea salt and paprika. Peel and cut the sweet potatoes into 1 inch thick rounds. Bake the sweet potato rounds for 8 to 10 minutes on each side until golden. Transfer to a serving tray and top with the goat cheese, candied walnuts, and cranberries. Spoon a little bit of wild honey on top of each potato round and sprinkle with the lemon zest. Just before serving finish with a light drizzle of orange infused olive oil, the balsamic glaze and garnish with the fresh basil leaves. 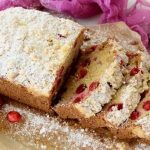 Oh my goodness, I am in love with this recipe! This would make for such an amazing Thanksgiving side! These wound delicious! My family is going to love these! I wanna hear all about it Tina, please report back! I think so Donna. It cooled off a bit and I caught the baking bug. I am loving your sweet potato obsession! 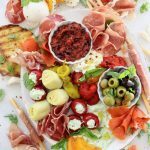 These look wonderful, very seasonal and perfect for a dinner party! Wow! THis little nugget is just layered in so many floavors. I would eat a whole an of them! Oh I love sweet potatoes! This looks amazing for the upcoming holidays! 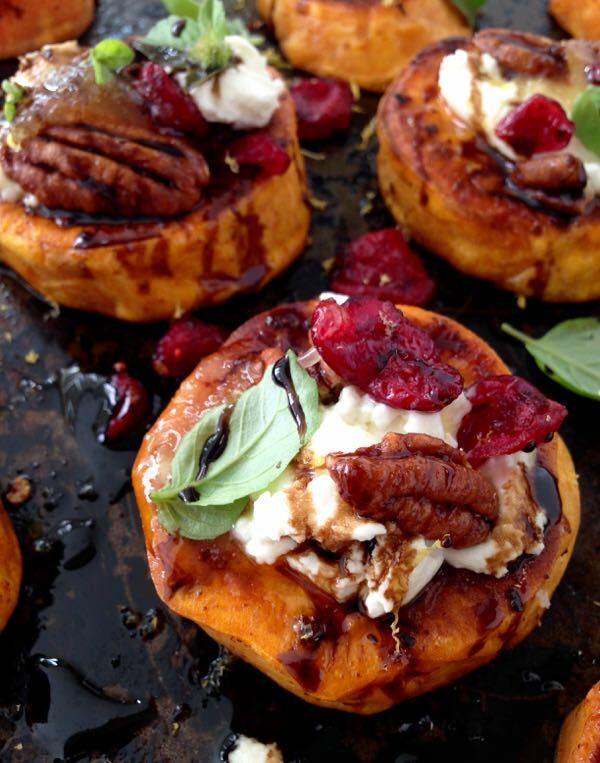 You had me at goat cheese and balsamic glaze! These absolutely wonderful! I need these in my life and especially this weekend when company comes into town. hanks for sharing! These are so, so fun!! I love the combination of colors and flavors. 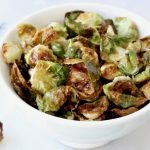 These would be a fun little appetizer to have sitting out at Thanksgiving when your guests arrive. These definitely look very, very festive and so full of flavor. The cheese and the cranberries are the perfect additions. 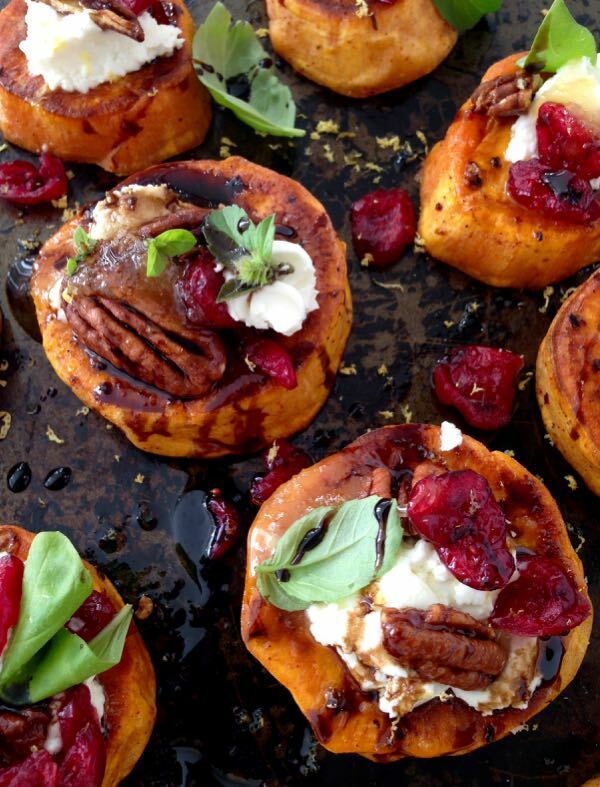 I love sweet potatoes and this looks like a perfect bite size appetizer. 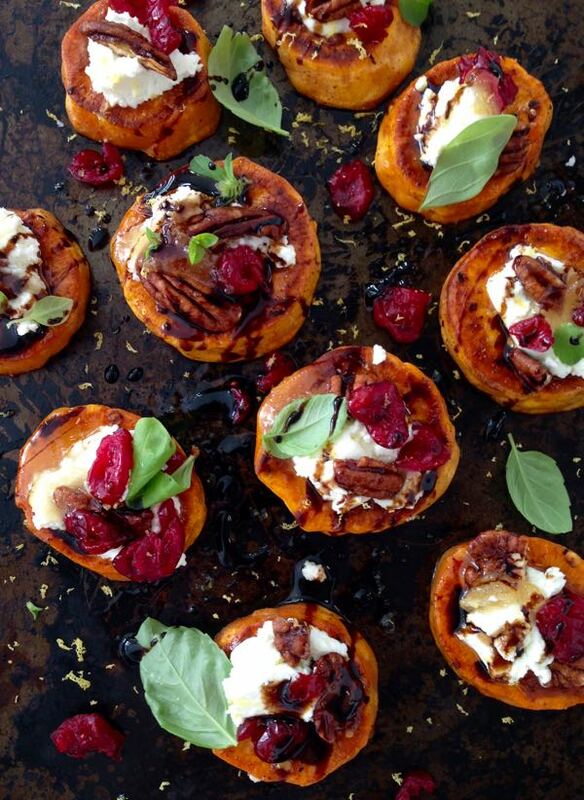 I love sweet potatoes too, this sounds like a delicious combination and so pretty too! These were delicious. And beautiful in presentation. Lot’s of flavors the meld deliciously. Big hit at my party. I suggest using skinny potatoes so that you can make them bite-size to pop in your mouth and get all flavors. Can be a bit messy when more than one bite. looks so good! Happy holidays! I had these at a party a few weeks ago. AMAZING!! So, I’m making them for thanksgiving. So glad I found this recipe! Thank you! Hi Melissa, so happy you found them too. Was it at a grocery store demo you had them by any chance ..? This sounds delicious however I need to make ahead. How long can they sit out at room temperature? Do they need to be warm when adding the toppings? Hi Sandra, these are best warm, so maybe you can keep them in the oven until ready to serve or reheat and add the toppings. This is just one of those recipes that it is best straight out of the oven. Do you purchase the balsamic reduction pre made or make it yourself? And if you make it, could you give me instructions? Thanks! Looks delicious and I’d like to make this for Thanksgiving. Hi Irina, usually for the holidays I use an organic store bough reduction from Italy. If you want to make your own simply reduce aged balsamic vinegar with a touch of brown sugar or maple syrup until thick and it coats the back of a spoon. Allow to cool and store at room temperature until needed. Enjoy! I made a simplified version of this (no nuts, didn’t reduce the balsamic, no blood orange, no basil) for a party. I was worried these might not work at room temperature. They were a smashing success! Thanks! 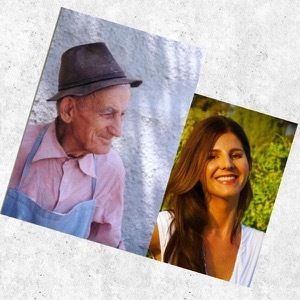 Channeling the Man in the Photo, one recipe at a time, mostly Italian and Vegetarian lifestyle! Please join my quest for the art of simple, rustic living, trying to capture the raw beauty of food & life through the lens of my Iphone - Florentina L.